Successfully Added Serpent Mini 22mm Diameter RTA - Single Coil Deck, Dual Air Flow, 3ml Capacity, Top Fill, 510 Fitting to your Shopping Cart. The Serpent Mini 22mm diameter RTA from Wotofo is one of the smaller RTAs on the market and is designed for single coil builds. Its clever setup makes access to the deck very easy which makes it a nice atomizer for newcomers to rebuildable tank atomizers. 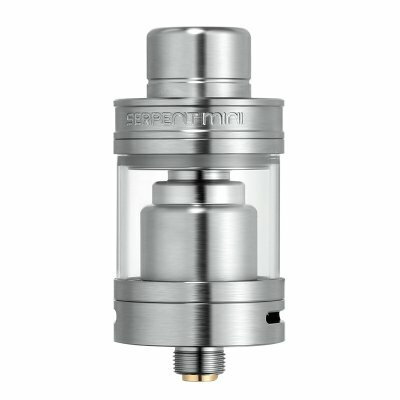 First-time rebuilders will find the Serpent Mini 22mm RTA really easy to get to grips with. The deck has two posts raising from it into which you secure the coils in a vice-like grip using the hex grub screws. Coming with three Kanthal coils and quality organic cotton you can get started right away. Screwing off the top of the RTA allows access to the 3ml tank for easy refilling, with its precision machining the thread is smooth, easy to use and won't leak making it a breeze to top up. The Serpent Mini has two adjustable airflow slots that can be adjusted from closed to fully open using the adjustment ring which has just the right tension for easy adjustments while not being too loose. When it comes to the vape test the Serpent Mini 22mm RTA doesn't disappoint in the taste or vapor department. The included coils and wicking offer a truly excellent experience producing a generous amount of vapor and full flavor taste. This great atomizer from Wotofo is a real winner with its ease of use and quality finish its well worth the money. The Serpent Mini 22mm diameter RTA from Wotofo comes with 12 months warranty, brought to you by the leader in electronic devices as well as wholesale E-cigs, vape kits, and atomizers..